The limited light. When you first enter a dungeon, you only see the square you're in. Light a torch and you can see adjacent squares. The actual distance you can see isn't too different from, say, Wizardry, but something about the overhead view made you keenly aware of how little you can see. The absolute pitch darkness beyond your field of vision. No gradual fade (as later remakes, in my opinion, mistakenly had). No hints of what might be beyond. Just black. That awful sound it makes every time you bump into a wall, which happens a lot, because you can't see. The way the radius of the Radiant spell (which lights a 7x7 area) gradually shrinks. You feel the darkness encroaching. I don't think torches ever actually burn out in DW, but as a kid, I was scared they would. The music. 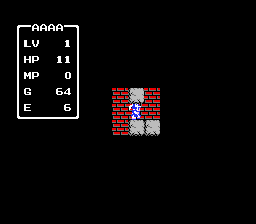 It gets slower, deeper, and creepier the farther down into the dungeon you go. You feel the distance from your exit. You're always aware of your slowly dwindling resources. Your HP, your healing herbs, how many Heal spells your remaining MP will allow you to cast. There is no place to rest. The only save point is back at the starting castle. How long do you dare press your luck and move on? The screen text gets redder as you approach death. The game makes you aware that you're now a scared thing, running from every encounter, hoping you make it home. Going to cost you half your hard-earned gold if you don't. So some of that might be exaggeration, but that is the experience I've been chasing ever since. When my players go into a dungeon, that is what I want them to feel. I did my best in the first campaign (OD&D) I ran with my current group. Tracked encumbrance to limit their resources. Light was mandatory underground, and I tracked how long it lasted. I experimented with severely limiting the range of light, only telling the players what they could see in a 10' radius around themselves. Given the things I heard, I was itching to try out Torchbearer. I was also looking to start a new campaign in a different setting. The timing was good. Bought a copy of the book at my FLGS and read through it in a night. I liked most of what I saw. Pretty straightforward dicepool system, good advice for referees on how to set the difficulty of tests, light/turns/encumbrance looked as abstract and easy to track as I had been hearing. I ran a 6+ month campaign with it. We did enjoy Torchbearer. Those six months had a lot of fun memories, all of which happened under Torchbearer. The twist-on-failure mechanic worked well with the setting. It made for a good excuse to introduce bits of strangeness. Similarly, Conflict compromises led to some memorable moments. Ample opportunity to make props. My players really liked the Instincts and Wises (even though they really didn't get to use the rules for Wises very often). They continue to base their characters' personalities on those even after we stopped playing TB. I didn't give the players a home base to operate from soon enough. TB really needs the players to have access to a town for recovery. It was a long time before my players had anyplace "safe" to rest at. It was a bad match of system and setting in the end. TB is almost all about dungeon crawls. The setting has a lot of political interaction and garden crawls. Everything progressed slowly. We'd get through a handful of dungeon rooms a session. Towards the end of the campaign, I avoided Conflicts entirely. They dragged things to a crawl. The ritualized, post-game assigning of fate/persona points based on goals & beliefs felt like it took time away from actually playing the game. Abstraction of money into Resources and treasure dice actually made things more complicated for my group. Are gold pieces really so hard to understand that they needed abstraction? The time between initializing a Conflict and a result actually occurring -- choosing conflict captain, deciding goals, rolling disposition, choosing initial cards, rolling the first test -- pulled us out of the moment. No matter how much narration we tried to inject, the Conflict mechanic always felt dissociated from what was happening. Too prescriptive. "These spells can only be used before rolling disposition, these when declaring conflict weapons, these outside of combat. Don't suddenly decide that now would be a good time for that spell." "You can't make camp yet, you haven't earned any Checks by using Traits against yourself. It isn't sufficiently dramatic yet." "No, you cannot try to run away from a Conflict that is obviously going against you. Try to earn a compromise using the same skills that haven't been working so far." Surprisingly a lot to keep track of. Maybe my shortcoming again, but I was constantly forgetting to add penalties for lighting, backpacks, conditions. Weapons and armor were forgotten many times. Equipment in "incorrect" encumbrance slots ("That's for a backpack slot, not a head slot.") And once things like conditions and lighting were being forgotten, my main reason for trying Torchbearer was gone. I did what I could to keep track of everything. Time tracking sheets, light tracking sheets, sheets of pre- and post- dice roll procedures, weapon cards, armor cards, equipment cards, reorganized character sheets. But I was spending more time and mental energy on the system than on my campaign. And I was no longer really getting the benefit I wanted from that system. I was no closer to my Dragon Warrior.